Halloumi cheese is a delicious addition to all kinds of dishes. Include it in sandwiches, curries, salads, wraps and all kinds of recipes! Find loads of halloumi recipes right here. Halloumi is a semi-hard cheese used in Turkish, Greek and Cypriot cuisine. It’s most commonly fried but can be prepared in other ways, check out this post for tips on how to cook halloumi. Is halloumi cheese good for you? As cheeses go, halloumi is quite good for you thanks to having a high level of calcium. It does, however, have a high amount of salt so that’s something to consider if you’re watching your salt intake. Can you eat raw halloumi cheese? While you’re able to eat halloumi cheese raw it’s much much tastier if it’s cooked first. Normally it would be fried but it can be baked or grilled instead. Keep scrolling for some amazing halloumi recipes. Is halloumi a hard cheese? Halloumi counts as a semi hard cheese. What milk is halloumi made from? Traditionally halloumi is make from a mixture of goat’s and sheep’s milk but now cow’s milk is often used as well. 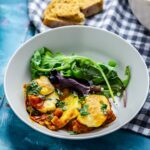 How do I cook halloumi cheese? 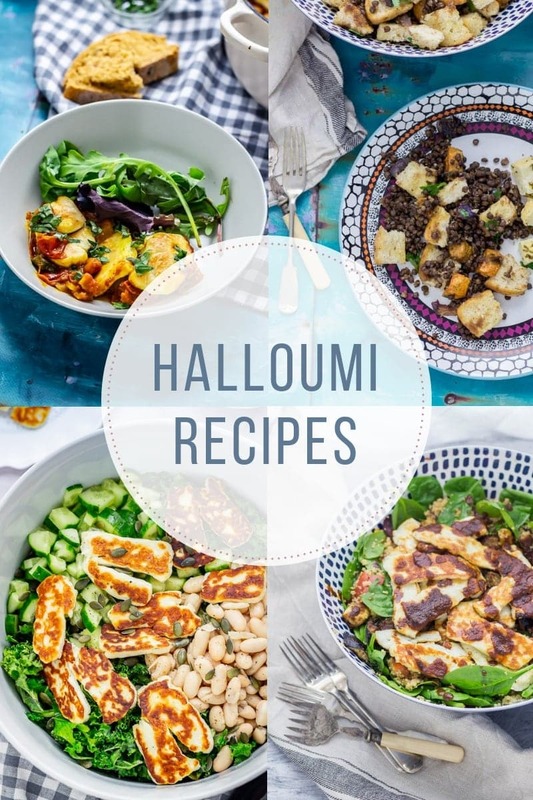 I’ve listed all of my favourite halloumi recipes below but I’ve also created a guide for how to cook halloumi which includes tips for grilling, frying, baking and barbecuing halloumi! It’s actually quite hard to describe the taste of halloumi and do it justice. It’s probably most similar to feta but when it’s cooked it’s got a much milder saltiness than that. The combination of the salty flavour and squeaky firmness is one of my all time favourite things. 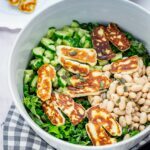 This harissa halloumi salad is so quick to make and is bursting with healthy ingredients! The salty halloumi is the perfect addition to this vegetarian dish. These halloumi tacos are beautifully spiced and topped with a fresh and healthy cabbage slaw. An ideal vegetarian Mexican dinner! This grilled halloumi salad is topped with a beautiful herby tomato salsa. 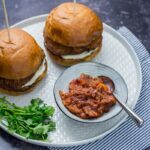 It's so easy to make and is the ultimate summer meal! 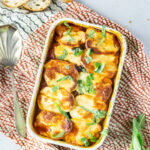 This vegetarian halloumi bake recipe is the perfect way to use this delicious salty cheese! The halloumi is layered on top of tomato and aubergine and cooked until browned and crispy.